While it's turned blustery cold (for most), I am planning for Summer. It's my favorite! 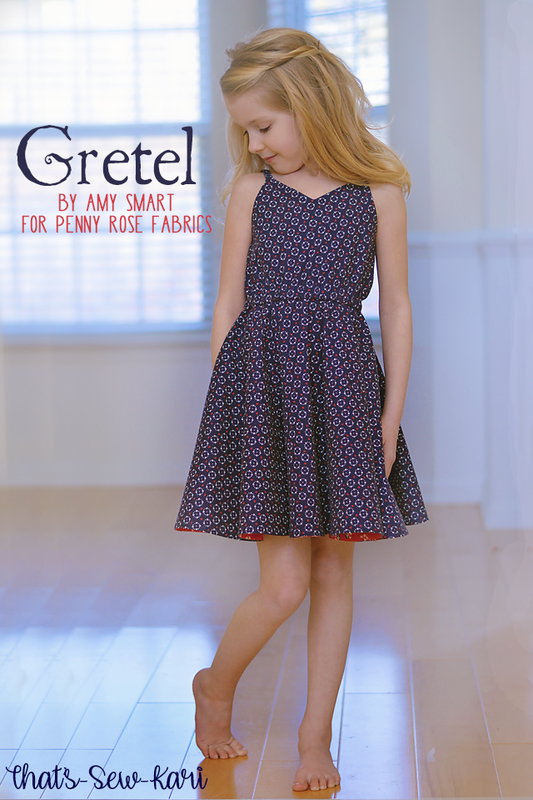 I started with three pieces for my youngest using the Gretel fabric collection by Amy Smart for Penny Rose Fabrics. It's a fun, cheerful collection in hues of primary colors. Daisies and hearts can be seen throughout the collection. I chose a mixture of colors -- Gretel Wreath Navy, Gretel Heart Yellow, Gretel Daisy Denim, and Gretel Gingham Red. Once my fabrics came in, I had my daughter decide what she wanted me to make. In just a couple weeks, she turns 8 so her input is a must! The first pattern she chose was her very own Sorrento by Little Lizard King. I've made her older sister 2 already and she really wanted her own. It's such a sweet summer dress and a quick sew. This time, I had to try out the circle skirt and it also gave me a chance to add a pop of the red at the hem using Gretel Gingham Red. This is her 8 year old "look" hahaha -- so grown up and posh. For her second outfit, she requested shorts and a button-down tank top. 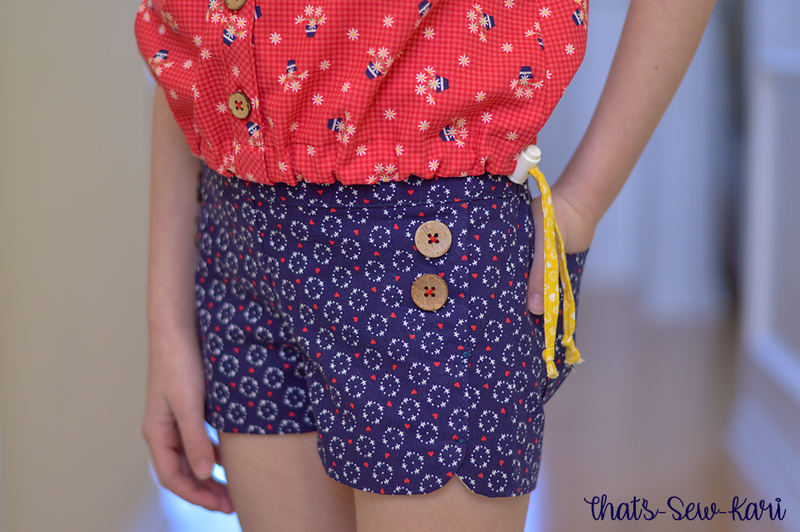 For the shorts, I sewed the Monaco Shorts by New Horizons Designs. I love, love, love this pattern. They are lined with the Gretel Daisy Denim -- 1/4 yd was just enough to cut all my lining pieces! For the top, I modified the Monterey Romper by Little Lizard King. She wanted something that buttoned all the way down, but she also wanted it to be able to be cinched. Instead of adding the shorts, I stopped the side seams 2" from the bottom. Then I simply turned up the hem 1/4" and then an additional 3/4" to make a casing. I used the Gretel Heart Yellow to make a tie and used a plastic spring stopper to secure it on one side. She can also wear it uncinched! 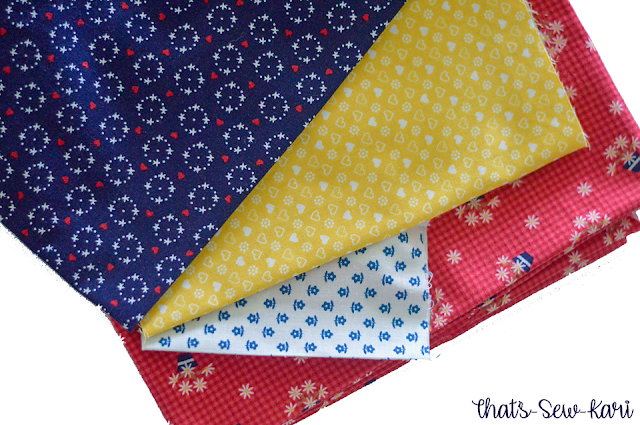 2 comments on "Gretel Fabric Collection by Amy Smart for Penny Rose Fabrics"
These are so adorable, Kari! Thank you so much for using Gretel for your beautiful work!! Thank you so much Amy!!! I am thrilled you love them!